These 20 ideas will give you more than enough content to keep your competitive edge in the online ranking race. When it comes to getting yourself ranked in the Google search engine results, few things can seem as challenging as trying to unravel the mysteries of local search. Many “how-to” articles focus on gaining ground with generalized keywords. However, if you have a real estate blog, generalities aren’t your focus. You’re looking to rank for very specialized searches that have to do with the area you work in. There are particular tactics one can take when trying to succeed in local search. Overall, content will be key. You’re going to want to write and write a lot. The more you can say about the location you work in the better. Talk about what goes in your area and who provides the best services. Know of a steakhouse that everyone is raving about? Give them a shout out! That might end up being a nice link to your blog if the steakhouse picks up on your write up. Of course, you’re going to want to target long tail keywords as well. 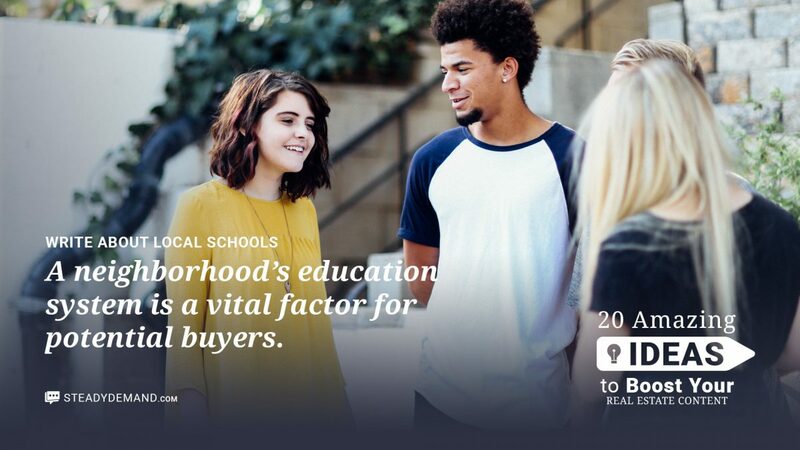 For example, “affordable homes in San Antonio” is probably a better bet than simply “buy a house” or “San Antonio.” Don’t be afraid to be specific because you occupy a specialized niche. At Steady Demand we specialize in helping businesses get results through a focus on social media and particularly through Google services. We have found that focusing on Google My Business for local real estate agents produces significant results. However, there are plenty of things you can do with your blog to dominate local search. Our social media strategy combined with these 20 content ideas will set your real estate blog apart from the competition. Sure this might sound obvious; however, we have visited many realtor’s blogs that did not include them. Featured listings are what visitors are coming to your site for. They want to know what the great deals are in the area. 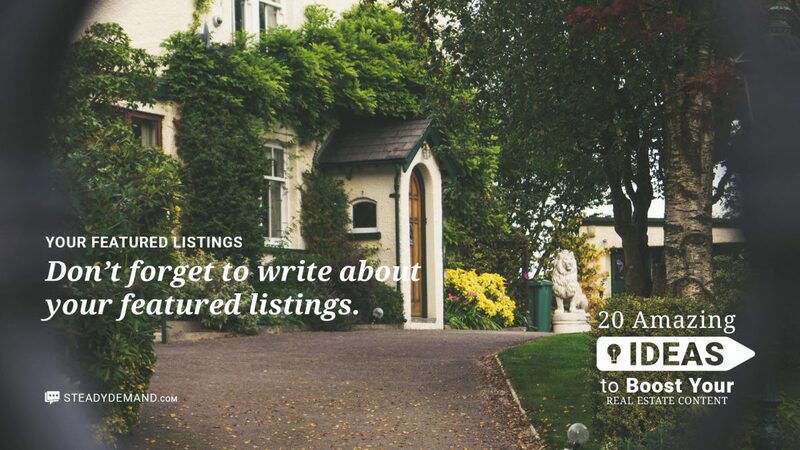 Make sure to include the address for each listing. The more information you include the better. This is another one of those easy wins that seems obvious, but many real estate agents aren’t including this important information on their sites. While the expectation is that people that are interested will pick up the phone and call, customers are using the internet as the first method of finding information. 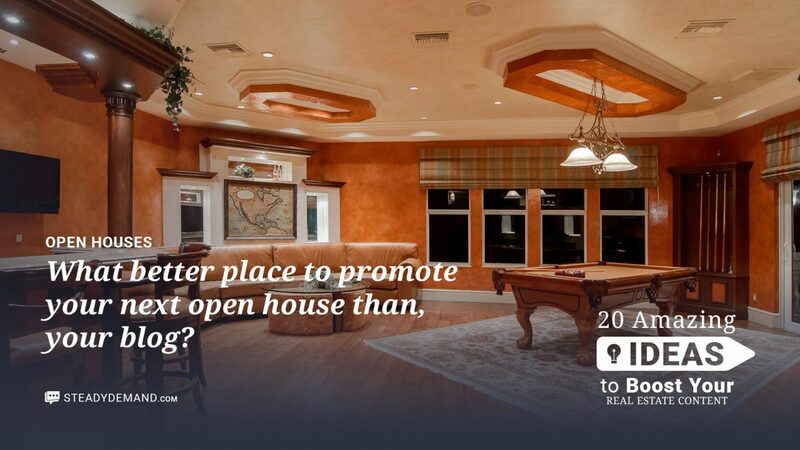 Again, like with featured listings, include the address and any other pertinent information to your open house listings. Trust in one’s expertise is key. There are many real estate agents, after all. By being an expert in your area, you set yourself apart. Potential homebuyers are looking for a real estate agent they can be confident about. Be sure to create separate pages for each neighborhood to help in search. This makes for easy readability and proper indexing by Google. This is especially important if you’re in a small town. Spotlighting local businesses accomplishes a couple things. For one, it further proves you have a strong knowledge of the local area. It’s also a great way to build relationships in the community and acquire some authoritative links to your blog. Reach out to them and let them know you are going to include them in your article and then email it to them when it is done and ask if they will link to or share the post. This will generate traffic from their sites and help yours in the search engines. If a school in your area is a National Blue Ribbon School, for example, be sure to highlight that on your site. Buyers looking to move into a new area may have done their research, but it’s hard to get a real grasp on the local culture without some direction. This is where your blog comes in. As an expert on the area you serve, you have crucial insights on how residents like to pass the time. 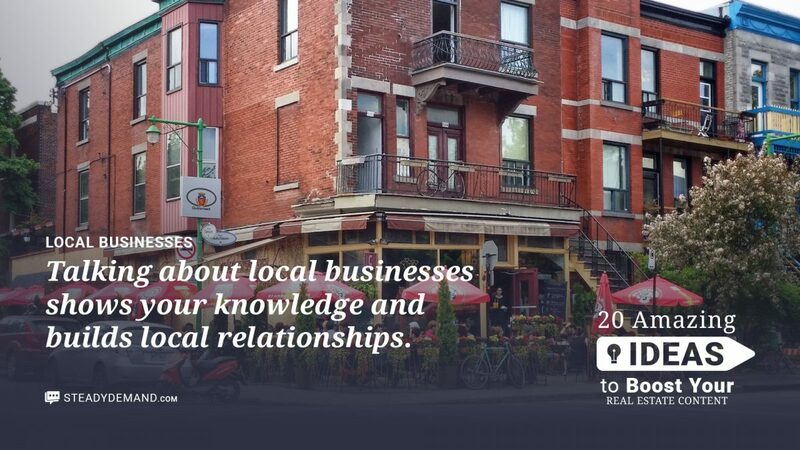 By highlighting the local flavor, you’ll encourage visitors which can translate into buyers. Much like the importance of focusing on what there is to do in the area, it’s key to focus on local events. What makes the area you work in unique? Perhaps there is a yearly music festival that features national acts. Maybe there is a downtown art festival every first Friday of the month. Potential homebuyers want to know these things so they can get a sense of the culture. The people who run visitmusiccity.com do a great job highlighting the local cuisine in Nashville. Note the use of the word “unique” to describe the restaurants in town. You’re missing out by not eating at these places. By doing something similar on your blog, you’re telling visitors what makes your area uniquely great. Few things are as daunting as moving to a whole new area where you may not know anyone. Provide listings for meetups, directions to places like City Hall, and any other resources you can think of that will make for a welcoming transition. This may not seem like an obvious suggestion, but many moving companies actually provide checklists on their sites. A real estate blog should, too, since customers find utility in them. After all, there are many things to keep in mind when moving. A set of reminders is an easy piece of shareable content to provide. Include links to the local post office and other helpful information. This is useful for both buyers and sellers. Is the area you work in considered a hot area? Is your town doing better than the one twenty miles away? Let your readers know. It can build excitement. Talking about the weather isn’t just for small talk at parties. People want to know what to expect when they relocate. We hear that people love to know if it’s a “dry heat” or not. Your mileage may vary. 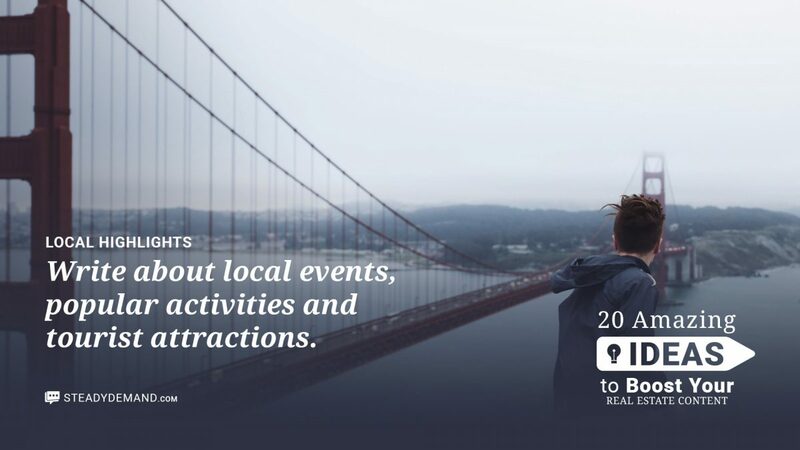 Similar to highlighting local events and restaurants, make a case for why someone would want to visit the area. A strong tourist presence can often indicate how well the local economy is doing which translates into high property values and good jobs. There is a lot of creative freedom here. Some topic ideas you may want to touch on include decorating your new home, home staging, curb appeal for when you’re ready to sell, and more. Include suggestions or links to local businesses. How is the economy doing in the area you serve? What industries are thriving? Homebuyers need to know these things. Highlight local networking events for business professionals. Also be sure to link to the local Chamber of Commerce. This will be of particular interest to business owners and entrepreneurs. Tell your story (and their stories) about why they like the area and working in the real estate industry. A personal touch goes a long way in developing a rapport. If you need some ideas, check out our About page. Content doesn’t have to be focused on the written word all the time. A picture is worth a thousand words, so a video is worth… a few million? We’re not entirely sure on the math for that one, but a walking tour video can be a great way to introduce the community to visitors. A “who’s who” of the area can continue to fill in the picture you’re looking to paint for homebuyers. Here is a great post by Gary Vaynerchuk to get you inspired. Why describe a place when you can show it? Show the world how beautiful the area you work in every day is. You can also incorporate your photos into your social media strategy. Instagram is perfect for this. As a real estate professional, you’ve got more potential for content than anyone could ever produce. Take advantage of it and you will thrive amongst your competitors. And, of course, if you just don’t have the time to create all of this content yourself, we’re happy to help! Feeling inspired by these 20 content ideas? Let us know what results you see by implementing them in the comments below and share our list! Christine DeGraff has over 17 years experience in web development, SEO and Internet marketing. Christine is one of the co-founders of the software company Circloscope whose flagship product is a circle management tool for Google Plus.